In a large bowl, whisk together the olive oil, salt, pepper, garlic powder, onion powder and thyme. Cut the chicken breasts into cubes . Add to the bowl and toss with the seasoned olive oil. Thread the coated chicken cubes on skewers. I use metal skewers that I bought on Amazon. If you use wooden skewers, place thin foil strip on their exposed edges to prevent burning. Bake the chicken kabobs for 15 minutes. Switch the oven to broil, place the baking sheet under the broiler, and broil just until browned, about 2 minutes, on the grill just turn as needed. You can add more marinate to them as you grill. Don’t be tempted to use boneless, skinless chicken with this classic recipe. The chicken skin holds the fat, and fat equals flavor. Plus, the skin helps the sauce cling to the chicken. In a large skillet with high sides, heat 2 tablespoons of ghee over medium-high heat, coating the bottom of the pan. Season the chicken with the salt and pepper and place in the pan. Sear the chicken until golden brown, about three minutes on each side. Remove the chicken from the pan and set aside. With the same pan still on medium-high heat, add the remaining 2 table-spoons of ghee, the onions, and the peppers, and sauté for two to three minutes, until the onions become translucent. Add the mushrooms and continue to cook, stirring for two minutes. Add the garlic and stir until aromatic, about one minute. Add the capers and diced tomatoes. Return the chicken to the pan and pour in the chicken broth or water until it covers the chicken pieces. Reduce heat to medium and bring everything to a simmer. Turn the heat to low and continue to simmer until the chicken reaches an internal temperature of 165 degrees F, about 30 minutes. Garnish with the chopped basil and serve hot. Preheat the oven to 350 degrees F. Put the chicken in a 3-quart glass or ceramic baking dish and sprinkle with salt and pepper. Bake until just cooked through, 25 to 30 minutes. Meanwhile, heat the oil in a large saucepan over medium heat. Add the garlic, onions, bell peppers and 1/4 teaspoon salt. Cook, stirring occasionally, until the vegetables are tender, about 15 minutes. If the mixture becomes too dry, add a tablespoon or two of water. Stir in the sweet and hot paprika and cook for 1 minute; add the tomato paste and cook another minute, stirring. Add the chicken broth and 2 cups water. Bring to a boil, and then reduce the heat to maintain a steady simmer. Simmer until thickened, about 5 minutes. Transfer the chicken to a plate. 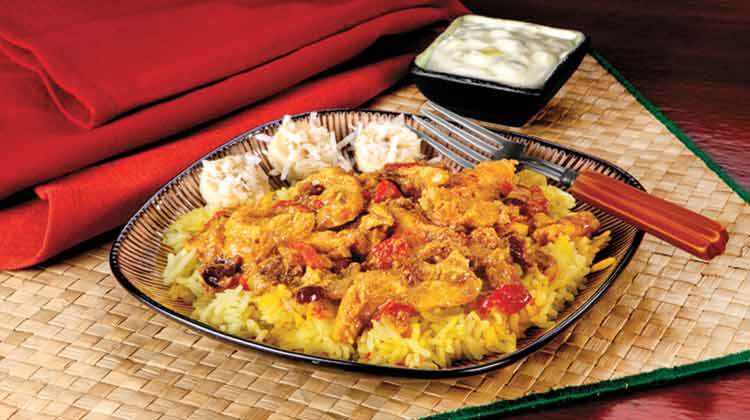 Spread the rice in the bottom of the casserole dish and top with the chicken and its accumulated juices. Pour the sauce over the whole mixture. Bake until the casserole is heated through and the top is browned lightly, 40 minutes. Top with the chopped parsley and serve with a dollop of sour cream. For freezing and reheating, allow the casserole to cool completely. Divide into 6 even portions and store in a freezer-safe resealable plastic bag or container. Transfer to a microwave-safe plate, loosely cover with plastic wrap and microwave until hot, 4 to 5 minutes. If you have never had curry, this is a wonderful dish to start with. It is not hot but is richly spiced and delicious. In a medium bowl, combine the chicken, yogurt, GINGER, GARLIC, GARAM MASALA or SWEET CURRY POWDER, TANDOORI SEASONING, CUMIN and lemon juice. Mix to combine. Cover and marinate in the refrigerator for a few hours or overnight. Heat the oil over medium-high heat in a large, heavy pan. Add the chicken and cook, stirring constantly, until the meat is white and almost cooked through, about 4-5 minutes. Add the tomatoes and mix well. Add the PEPPER, cream, water and cashew nut paste. Reduce heat to low and cook until the chicken is tender, 5-7 minutes. Stir until the sauce thickens. Add the butter and salt and mix well. Garnish with fresh cilantro if desired and serve with Cumin Rice. Servings 4; Serving Size 3/4 cup (284g); Calories 360; Calories from fat 180; Total fat 20g; Cholesterol 125mg; Sodium 270mg; Carbohydrate 10g; Dietary Fiber 3g; Sugars 4g; Protein 36g.